ECUADOR: Ecuadoran leader Rafael Correa insisted his revolution is unstoppable as he celebrated victory Monday in the country's presidential election, with early results giving him a huge 33-point lead over his main rival. "Nobody is going to stop this revolution. 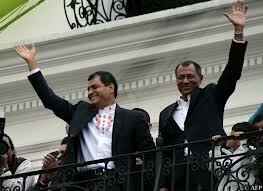 We are making history," said Correa, claiming outright victory in the first round of the vote. "We are building our small homeland, and a larger one, too" he said Sunday, referring to Latin America. With 54 percent of the ballots counted, Correa was ahead with nearly 57 percent of the vote, compared to banker Guillermo Lasso's 23.7 percent. To avoid a second round run-off, Correa must secure either 50 percent of the valid votes or 40 percent with a 10-point lead over the nearest contender. And the numbers indicated there was little that could stop him from achieving this goal. Lasso, who served as finance minister during an economic crisis in the 1990s, conceded defeat shortly after the results were announced. "Decent people like you, my family and my co-workers recognized the victories of other, and this night, I want to recognize the victory of President Rafael Correa," Lasso said in his concession speech. Correa, 49, told a crowd from the balcony of the presidential palace that he was determined to continue serving his people and ensuring the country's progress. "And I'd like to take this chance to dedicate this victory to that great Latin American leader who changed Venezuela, Comandante Hugo Chavez Frias," Correa said, the cancer-stricken Venezuelan president a swift recovery in Cuba. Charismatic in his supporters' eyes and authoritarian to his foes, Correa's announcement came shortly after polls closed in an election he had been widely expected to win. At stake besides the presidency were the country's vice presidency and 137 seats in the unicameral legislature. Opinion surveys indicated that Carrea's Country Alliance was poised to win between 60 and 65 percent of the parliamentary seats.